Thought Google+ was getting stale? Think again. Google announced a complete redesign for its social network, which now boasts more than 170 million users. 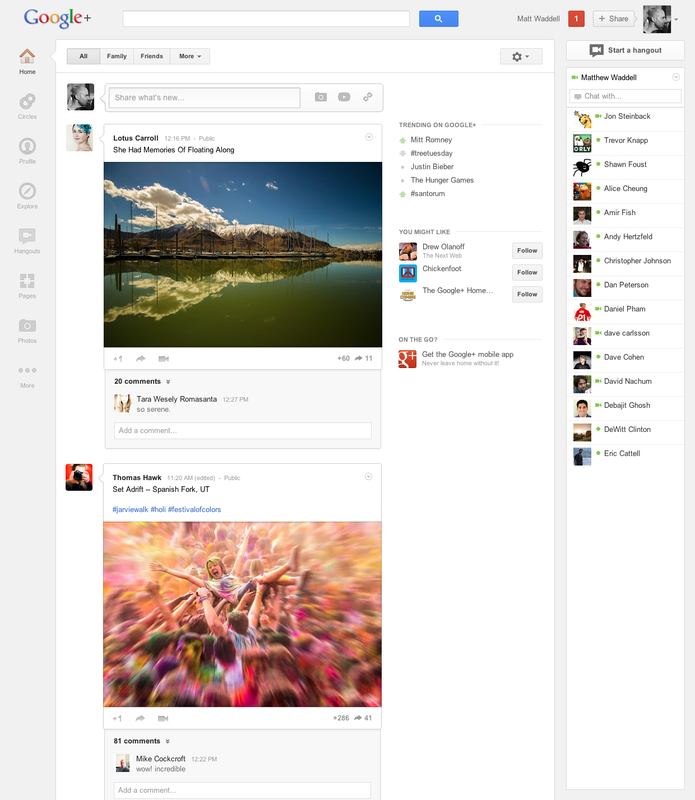 The new interface improves on the photo and video experiences and there’s also a new hangouts page among other changes. 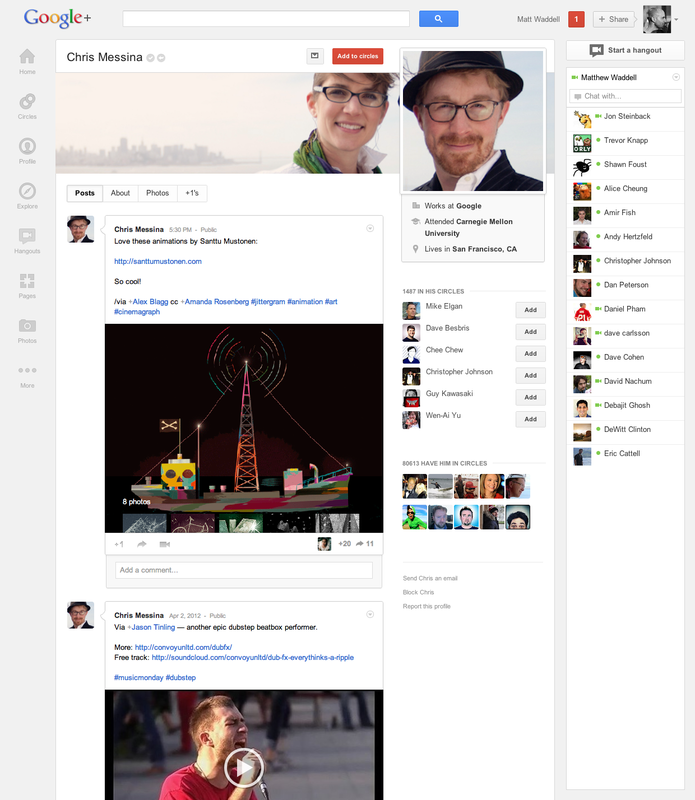 The new Google+ look has not rolled out to everyone just yet, but it should be in the next few days. 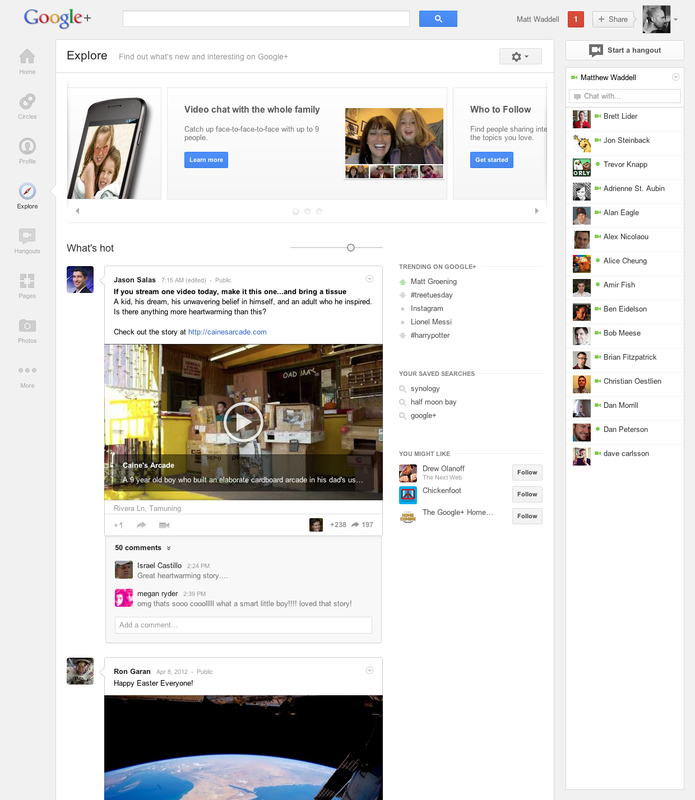 The first thing you’ll notice with the new Google+ look is that the navigation system has changed. Instead of the five-button bar at the top of the page, Google added what it calls a “navigation ribbon” along the left side of the page. The “apps” are basically the same Circles, Profile, Hangouts and Photos, and you can hide or rearrange them to your liking. Hovering over apps also gives you extra options, such as adding photos. The look of the news stream is also updated. The photos are full bleed and posts are now shown in “conversation cards” that are better at separating each post. Under each post you will find the “activity drawer,” which is where you will now find how many people +1’d a post, reshared it and added comments. Meanwhile, the profile page sports bigger photos and the chat list has been moved to the right, occupying the full height of the page. Hangouts on Goolge+ are now more accessible, as Google moved the feature into its own “app” in the navigation ribbon. The page acts as a destination where you can find all hangouts currently in progress that you can watch or join, including a list of popular hangouts. The Explore app is the page where all trending and interesting shares on Google+ can be found, and trending topics are displayed on the right of the news feed as well. While the Google+ redesign looks very clean and functional, I can’t help noticing Google is drawing even more inspiration from its competitors, Facebook and Twitter. The ‘Trending on Google+” box is akin to Twitter’s own trending topics, including the use of hashtags. As for your profile, you can now select a cover photo for your profile -- yes, it’s called the same thing as the Facebook Timeline feature, and it’s very similar in the way it works, too, just that you have your main profile photo on the right, instead of underneath. Did the new Google+ go live for you? What do you make of it? Sound off in the comments.